If you’re familiar with our work, you know we have a thing for wallpaper. 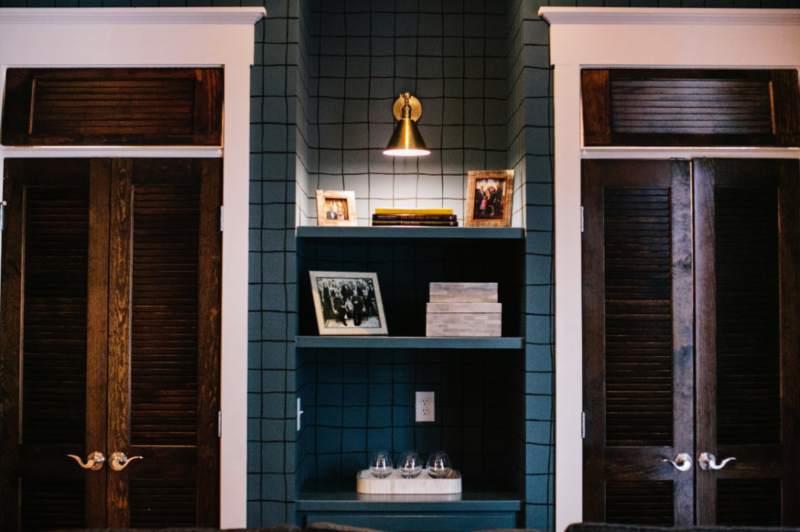 From a traditional floral print to masculine plaid to textural grasscloth and everything in between, we always rely on wallpaper to make a serious statement in our Wilmington interior design projects. Reach out to us if you need help choosing the perfect wallpaper and having it installed in your home. Read on to learn more about our interior designers’ favorite ways to use wallpaper. 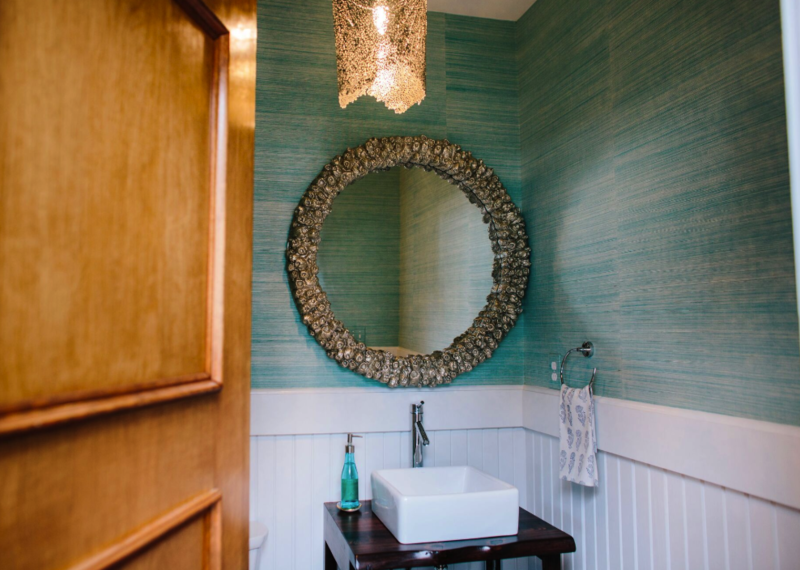 Our head interior designer, Lindsey Cheek, chose a sea-glass blue grasscloth in this small powder room at #clientbeachroadnorth. The bold color and texture works in the small space where the design elements elevate an otherwise ordinary room. 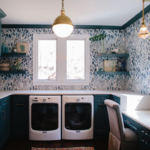 Who else has laundry room envy after seeing this fun space from #clientpierpointdrive2? This is probably our favorite example of how to add a big dose of personality to a mundane space. This young family does more than their fair share of laundry, so why not create a chic, happy room to do this dreaded task? 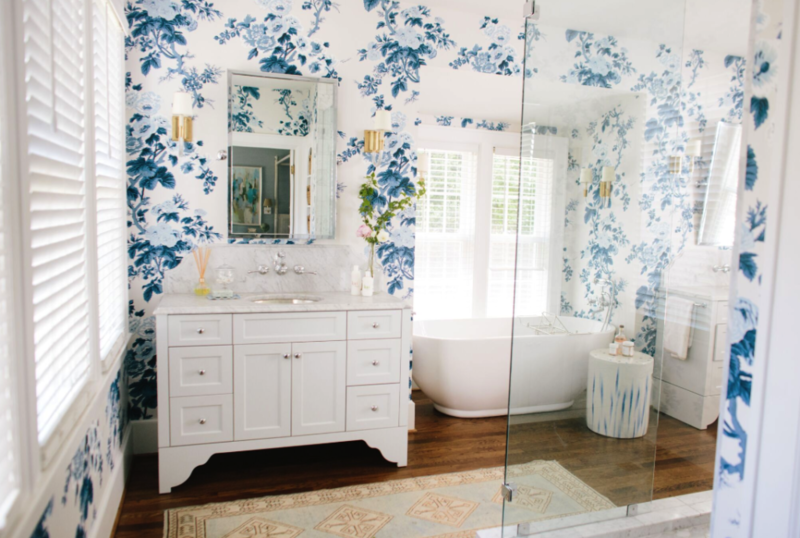 Lindsey chose this large scale floral wallpaper for her master bathroom at #projectcheekwood. 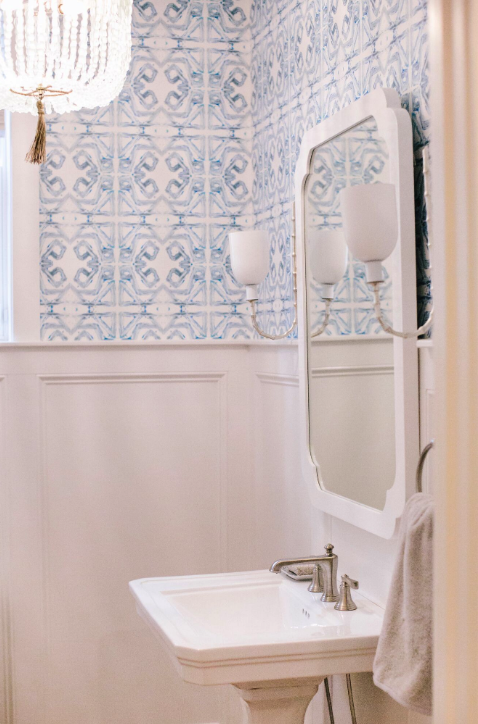 Because the bathroom was filled with light from the many windows, she selected this classic blue and white pattern to cozy up the space while adding an element of traditional design. 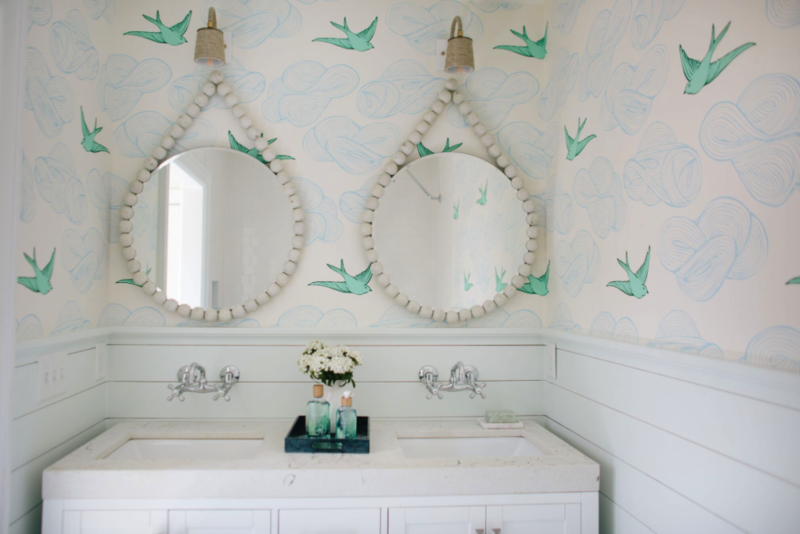 If you are wondering – yes, you can wallpaper a bathroom. Back in the day, moisture would damage the paper and make it peel. Now, glue and wallpaper products have come far enough that the extra moisture in a bathroom is no longer an issue. Just make sure you have a knowledgeable wallpaper installer! The playful bathroom pictured below is shared by a precious sister and brother duo (who just so happen to be Lindsey’s kids!) Lindsey opted for this gender neutral, whimsical print to appeal to both of her children. However, she knew that their grubby, wet hands would be all over the paper, so she utilized shiplap half way up the wall to prevent that. Here’s another great instance where wallpaper can instantly change the feel of a space. Lindsey chose this stunning graphic wallpaper from Lindsey Cowles to transform the powder room at #clientgraygables. Add a gorgeous chandelier and sconces, plus a pretty mirror and you have a little jewel box of a powder room! While we typically use fun and feminine wallpaper in our projects, Lindsey chose this deep green plaid wallpaper for a small den at #clientgraygables. This space is meant to feel cozy and dark, a nice contrast to the rest of the sunny, bright home.